When Duke Zeller died March 9, 2014, our Class of 1960 lost a leader and dear friend. I knew Duke well. He was the first fellow Page to welcome me as school began in early January 1959. We immediately became friends and roomed together at “Ma” Jarret’s tourist house on East Capitol St. during our senior year. All of us, his 22 classmates and other Page classes, benefited from Duke’s incredible personality. He had an appealing combination of enthusiasm, intelligence, and charm. Duke attended CPS for all four years of high school, during which he was president of the student body; co-editor of the “Capitol Courier”, our school newspaper; member of the National Honor Society; president of the Key Club; a contributor to the “Congressional” yearbook; plus numerous other activities. I remember that in early 1960 he competed and won the title of Junior Ambassador to Great Britain, a national contest sponsored by United Artists. He traveled to London where he was an honored guest when he attended the world premiere of the movie, “On the Beach”. Also around that time, Duke was a contestant on the popular “What’s My Line?” TV show. I thought for sure that he would stump the panel with his Page vocation but they guessed his “line’ within a few minutes. When Duke graduated he did so with honors as our class Salutatorian and delivered his speech to us: graduates, parents and guests, which included Senator Barry Goldwater, who delivered the commencement address. Duke was honored, as noted in the Congressional Record of Sep. 20, 1967, by Senators Everett Dirksen and Chuck Percy, both of Illinois. They acknowledged Duke’s many achievements, awards and contributions as well as his dedicated service to the Senate. After graduation most of us lost contact, that is, until our first reunion in 1980 which was led by Duke. He created and organized all of the weekend activities, meals and entertainment, which included a banjo player and mint juleps at his home at Burnsides Manor in Fredericksburg, VA. And because that first reunion was so successful, we have retained Duke’s format as the basis for our subsequent reunions. Since 1980 we reunite every five years and usually have “mini” interim reunions as well. 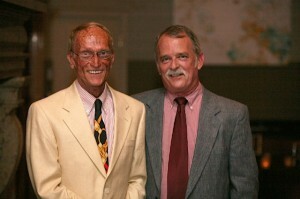 The latest “mini” in October of 2012 was co-hosted by Duke and his lifetime partner, Stu Mills, near their home in the Blue Ridge mountain area in Virginia. Stu assisted Duke, who despite complications from Parkinson’s, insisted on organizing and taking the lead role for the weekend activities. That was the last time I saw Duke. And when our class meets again in 2015, we will take time to remember Duke and other classmates who have died. I doubt I’ll have the words to express my appreciation for having known such a kind and generous classmate and friend. 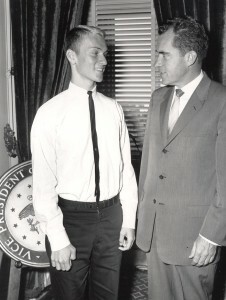 Duke Zeller, House, 1960 pictured above at the Class of 1960 reunion with a fellow Page and below with Congressman Richard Nixon.